Let’s assume you’re a wine enthusiast and that you invest a lot of your precious time and money in selecting high-quality wines. Wouldn’t knowing that your highly prized wines are being kept under optimal conditions give you peace of mind? Inappropriate storage can ruin fine wines – not only that, it can also cost you a lot of money and be extremely frustrating. Achieving the best possible storage conditions for wine – conditions under which its full aroma and flavour can unfold – requires the dovetailing of three essential factors: the correct temperature, optimum air quality and protection from UV light. As things have developed in our modern homes, there usually isn’t anywhere that has the right climatic conditions for a proper wine cellar. The storage areas in more recently built housing are typically too warm and too dry to store wine safely over the long-term. Storing wine at too warm-a-temperature isn’t good for it: when the temperature of a wine is too high, the kinetic energy of its molecules increases and this accelerates the maturing process, which increases the likelihood of the wine spoiling. What is a wine storage cabinet? When properly stored, bottled wine continues to develop its natural aroma and flavour, with the wine becoming deeper and more complex as the ageing process progresses. Successful long-term storage of wine requires two things: a wine of inherent good quality and consistent suitable storage conditions. Liebherr’s wine storage cabinets create conditions similar to those of a wine cellar, which are perfect for ageing in the bottle. A constant temperature prevails throughout the entire interior compartment making wine storage cabinets the optimal choice for long-term storage and for maturing wines. 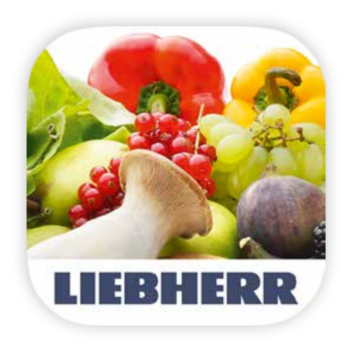 At Liebherr we offer two model ranges: GrandCru and Vinothek. 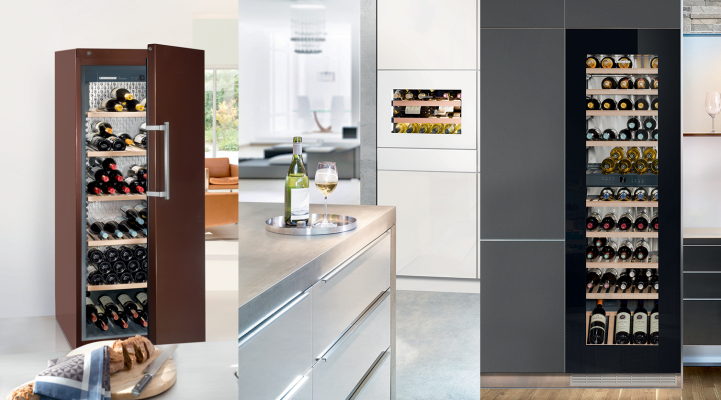 GrandCru wine storage cabinets have a wealth of high quality features and, with a variety of models on offer, you can choose the appliance that suits your specific requirements and fits the space you have available. Our largest model, the WKt 5552, has a storage capacity of 253 Bordeaux bottles, whereas the WKes 653 stores up to 12 Bordeaux bottles and can easily fit into a small niche. A constant temperature of between +5°C to +20°C is maintained throughout the whole of the interior compartment, and this can be set as required. Vinothek wine storage cabinets offer lots of useful features and are available in various sizes. Their storage capacity ranges from 200 Bordeaux bottles (400 litres net volume), with the WKb 4212 (pictured below), to 66 Bordeaux bottles (128 litres net volume), with the WKb 1812. Again, a constant temperature of between +5°C to +20°C is maintained throughout the whole of the interior compartment, and this can be set as required. What is a multi-temperature wine cabinet? A wine’s aroma unfolds fully when it is served at the correct drinking temperature. 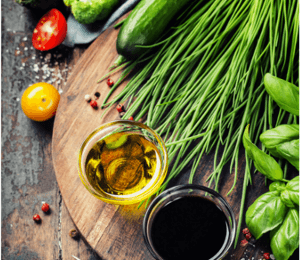 This temperature will vary according to the type of wine and also according to personal taste, the time of year, and whether it’s being served as an accompaniment to food. The basic rule is that red wines should be served slightly warmer than white wines but not at room temperature. The aroma and flavour of sparkling wines and champagnes emerge at their most distinct when they are well chilled. 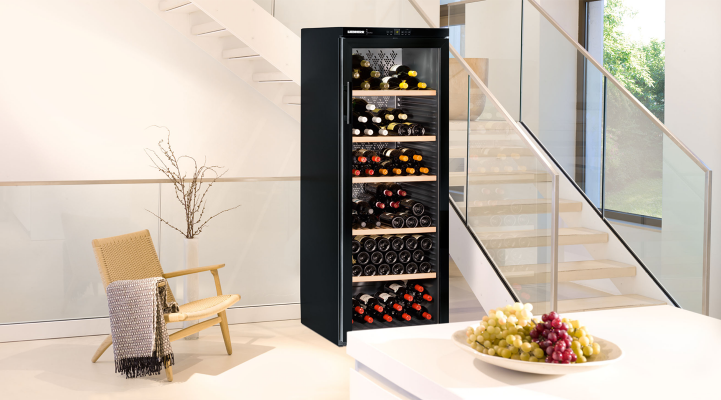 A Liebherr multi-temperature wine cabinet affords the opportunity of having both a chilled bottle of champagne ready to be popped and a great bottle of red at its ideal serving temperature, ready to welcome surprise guests. 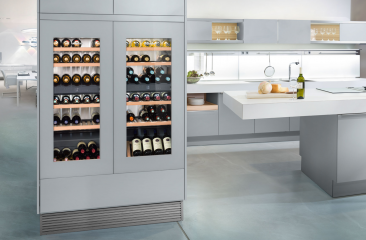 Liebherr offers two ranges of multi-temperature wine cabinets: Vinidor and Vinothek. 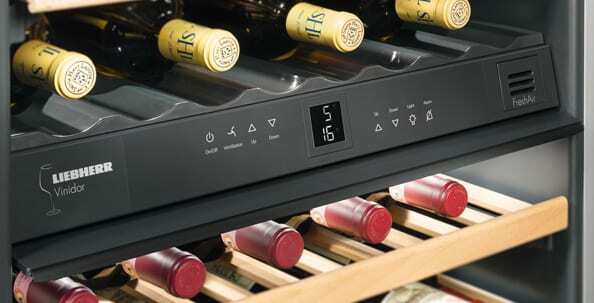 Vinidor appliances feature two or three wine safes which can be individually set between +5°C to +20°C with degree accuracy. This means that Vinidor appliances offer the greatest versatility in terms of application. A Vinidor cabinet can, at one time, store red wine, white wine and champagne, each at optimum drinking temperature. If required, the wine cabinets in the Vinidor range can also be set to create the ideal climate conditions for long-term wine storage. 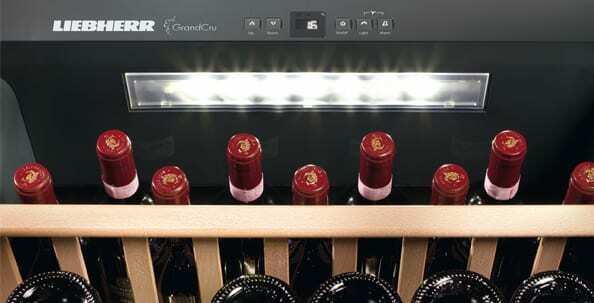 Find out more and view Liebherr’s Vinidor multi-temperature wine cabinets here. Vinothek multi-temperature wine cabinets feature specialised technology that produces stratified temperature layers within the appliance. For example, in the upper area, red wines can be stored at +18°C. The lower area is especially suited to storing sparkling wines or champagnes at a serving temperature of +5°C. 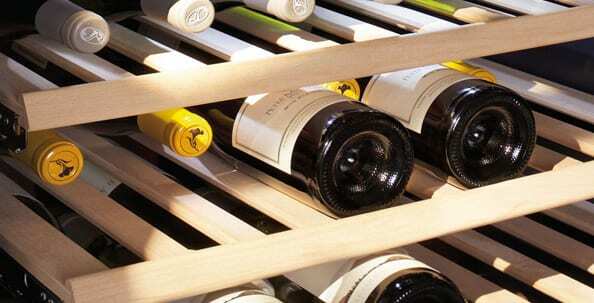 Meanwhile, the middle section is ideal for storing white wine at drinking temperature. 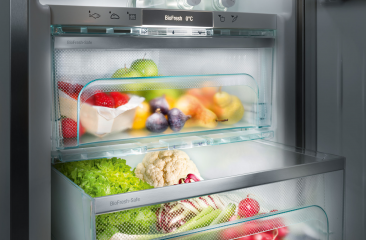 Find out more about Liebherr’s Vinothek multi-temperature wine cabinets here. 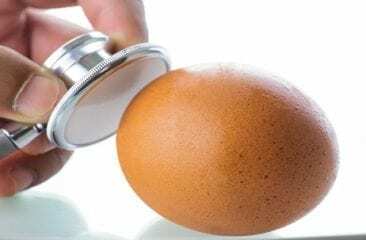 Invisible ultraviolet (UV) rays within the light spectrum cause damaging chemical reactions in wines – visually, red wines fade and white wines take on a golden yellow colour. French wine culture has a novel description of this effect: the “goût de lumière” (literally the “taste of light”) and, in order to prevent this deterioration, wines are often bottled in coloured glass (brown or green), which absorbs a large proportion of the troublesome rays. However, this alone is not enough to protect bottles, unless they are stored in the dark. 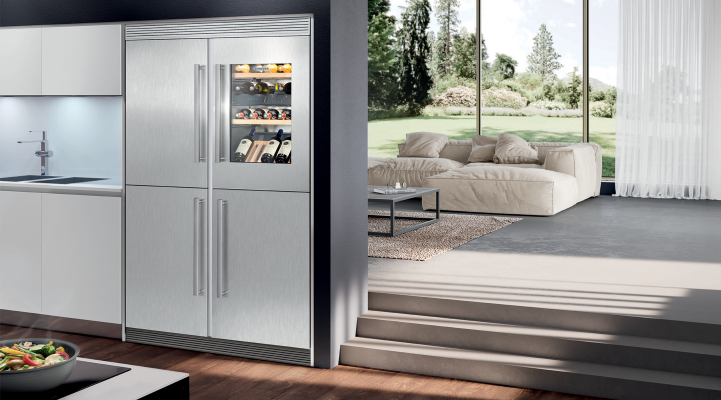 Liebherr’s wine cabinets, therefore, feature insulated glass doors with special UV protection. Their double-glazed construction, with an inner tinted glass pane and an outer metallised “low-e” pane, means that most of the damaging UV radiation is reflected away. In addition, the cabinets benefit from LED lighting, which guarantees perfect illumination of the interior without any UV exposure, as the LED light spectrum has no UV content. LEDs offer another advantage too: they generate very little heat, and so wines can be presented under illumination for long periods without warming. 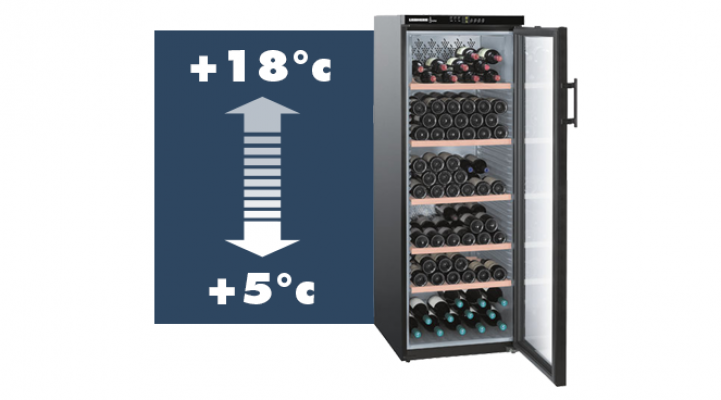 The ideal long-term storage temperature for all wines lies between +10 °C and +12°C and it is important that the storage temperature is kept constant. Liebherr guarantees this consistency – even when ambient temperatures fluctuate considerably – by using precise electronic control systems in conjunction with the very latest climate control technology. Our Vinidor models offer either two or three wine safes so that different types of wine can be kept at their optimum drinking temperature. 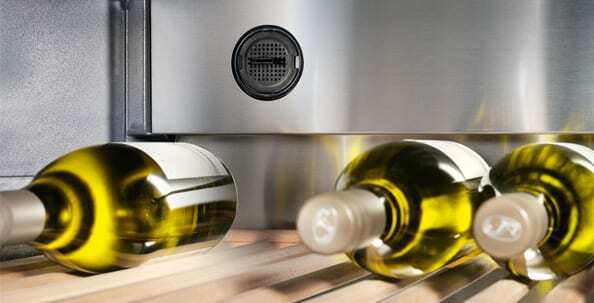 These degree-accurate wine safes can be set to between +5°C and +20°. 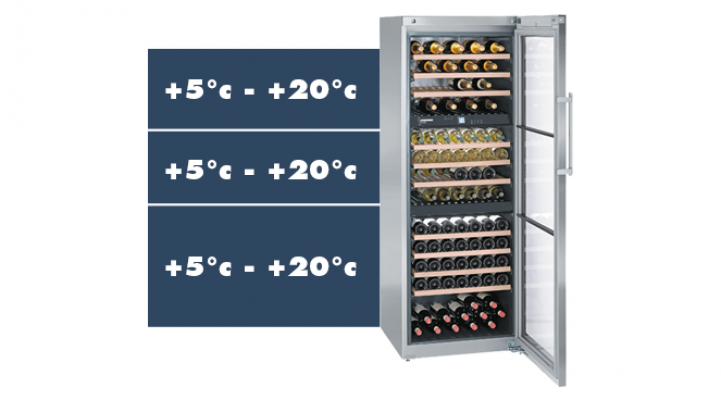 Meanwhile, Vinothek multi-temperature wine cabinets establish stratified temperature layers. The lower area, where the lowest temperatures prevail, provides optimum storage for sparkling wines and champagnes, whilst red wines are best stored in the upper region, at a temperature of around +18°C. White wine can be suitably stored in between these two, in the middle region. 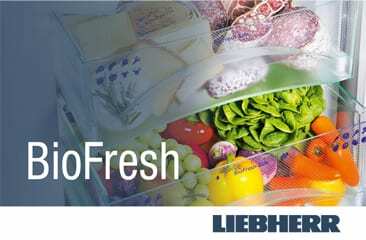 Liebherr wine cabinets have a built-in FreshAir activated charcoal filter that provides optimum air quality. This filter prevents transmission of odours into the interior compartment from the ambient air; odours which might well harm the taste of the wine. Vinidor appliances, both freestanding and built-in, have an activated charcoal filter in each wine safe. Appliances in the UWT and WT series have a FreshAir activated charcoal filter in the intervening partition, which serves both zones. In addition, sustaining the correct humidity level plays a crucial role in the successful long-term storage of wine. The reason for this is that, at a humidity level of less than 50%, natural corks begin to shrink. If the cork’s fit is compromised, oxygen can enter the bottle and the alcohol starts to evaporate. In this instance, wines will become sweeter and eventually spoil altogether. 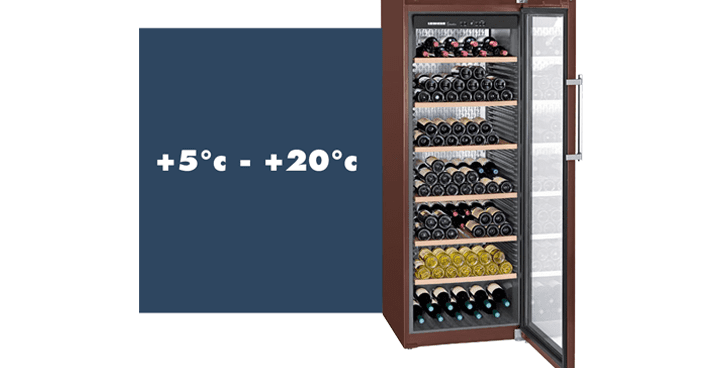 Vinothek multi-temperature wine cabinets provide different temperature zones and feature porous lava stones that allow the humidity to be regulated as required. Specially developed, extremely low-vibration compressors ensure that wine in Liebherr cabinets is stored gently and protected from vibrations. 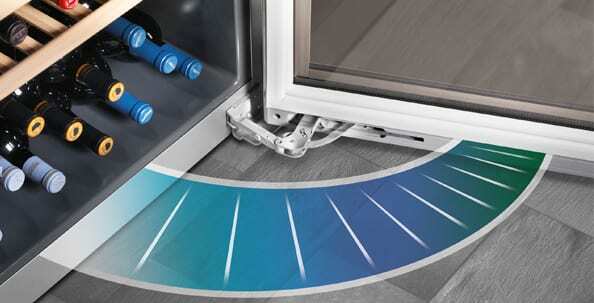 What’s more, with the SoftSystem cushioned door closing mechanism, gentle door operation is guaranteed. The wine cabinet door closes automatically from an opening angle of about 45° degrees in freestanding models (from 30° in built-in models) and sturdy, handcrafted wooden shelves provide efficient storage. The wooden shelves have an untreated natural finish, which allows wines to mature without being harmed by any paint chemicals. At Liebherr we are passionate about wine and passionately committed to developing innovative appliances that deliver premium storage conditions for your precious fine wines. You can view our current wine cabinet ranges here. If you have any questions about the correct way to store wine, please get in touch! Reach out to us on Facebook, Twitter or Instagram. Why have lava stones in wine cabinets? Barriques and other barrels. Why wine comes in barrels.